Masters programme in Clinical Embryology and Reproductive Biology (CERB). Infertility is currently estimated to affect 1 in 7 (~70 million) couples, while ‘sub-fertility’ affects 1 in 15 men worldwide. Sub-fertility issues are particularly relevant to Saudi Arabia, particularly male-associated issues. 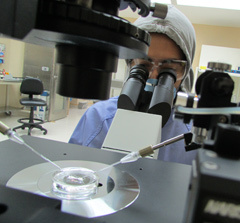 To aid in the treatment of such conditions, couples now increasingly have the option to utilise assisted reproductive technology (ART), a series of clinical laboratory techniques designed to combat conditions of infertility, to treat their particular case. ART is a series of techniques that requires a considerable level of highly specialised skills for embryologists (skilled clinical laboratory scientists) to be competent in performing the various methodologies involved. Embryologists are required to work as part of a multidisciplinary team within the IVF clinic, utilising a number of complex methodologies in a highly demanding setting. As the number of patients who require and seek infertility assistance rises, the demand upon fertility clinics continues to mount. A current major concern is that there are too few appropriately trained clinical embryologists in the Middle East, particularly within Saudi Arabia, to maintain this pattern of growth. Moreover, ART as a whole is becoming ever more closely regulated, with greater emphasis on quality assurance. In response to such challenges, and the unique cultural and social requirements in the Middle East, Alfaisal University alongside the King Faisal Specialist Hospital and Research Centre (KFSH&RC) have together initiated the launch of a novel graduate Masters programme in Clinical Embryology and Reproductive Biology (CERB). Combining the medical education expertise of the region’s leading medical school at Alfaisal University with the world-class facilities available at the KFSH&RC, this unique graduate program aims to train and develop the region’s leading Clinical Embryologists and Reproductive Scientists. Designed as an option of the highly successful Master’s programme in Biomedical Science at the College of Medicine in Alfaisal University, the CERB option is a two-year full-time program designed to provide graduate students, scientists and clinicians with training in human reproductive biology, clinical embryology and ART. The curriculum is designed to train core competencies in clinical embryology theory and practice. Reproductive Physiology, Molecular genetics and cell biology will dominate the 1st semester providing a solid grounding in theory which will be a vital prelude to the more specialised CERB subject courses. The molecular theory will be complemented by a specific practical course in the same semester. From the 2nd semester CERB subject courses will dominate and the 3rd and 4th semesters will largely be concerned with a research dissertation (either a research thesis or smaller research project). During the 3rd and 4th semesters the focus on hands-on research will ensure that students gain confidence and competencies in laboratory and/or clinical settings. Students will achieve further competencies during the write up their research project. ART and the reproductive sciences are very dynamic fields of clinical and scientific expertise, and as the proportion of couples seeking fertility treatment worldwide rises, it is of absolute importance that we train the next generation of clinical embryologists and reproductive scientists in line with the challenges posed by global, and regional requirements. it is also essential that such programmes are structured to provide students with specific expertise, relating to both global and regional requirements. Addressing such issues will enable the development of not only world-class embryologists, but also reproductive scientists, that are able to ensure the rapid development of this ground-breaking field to address the needs of this rapidly developing field, ultimately delivering to patients the best treatment options, and best chances of success.